The robot was basically a box within a box. It was based off the “Hungry Hippo” game. The Steel Falcon II rarely worked and rarely finished a match working! 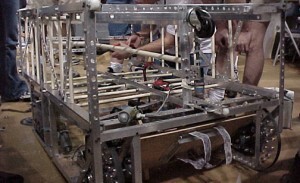 Our favorite memory with the Steel Falcon II is when it almost fell on one of the judges. The robot’s greatest accomplishment was that it didn’t kill the judge when it fell!